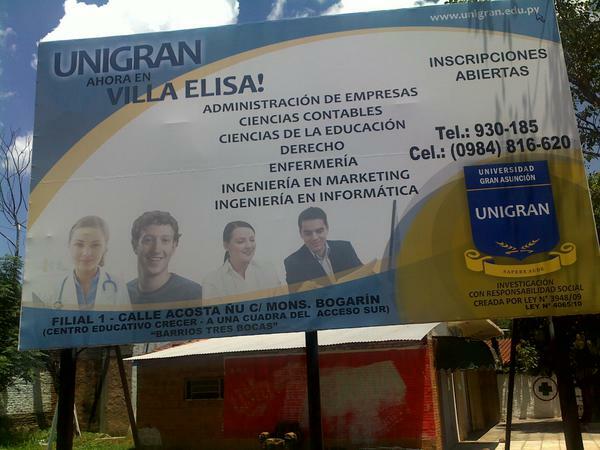 In 2013, Unigran, a Paraguayan private university controlled by a local congressman, used one of the classic portraits of Mark Zuckerberg in a billboard to promote their admission process. He appears next to a woman dressed as a medical practitioner and two other people with unknown professions. The sign also displays a mobile phone number, a coat of arms with a motto in Latin and other informative elements. The image went viral on the Internet. The general tone toward this anecdote was contempt against Unigran, an organisation which fits perfectly within the profile of the Latin American private university: an institution that provides questionable-quality education targeted to people who cannot afford admission to traditional universities. A transnational perspective on class also emerged among the comments of this infamous billboard, many people joked on the possibility of Mark Zuckerberg studying in Paraguay and not in Harvard. In Latin America we love that kind of joke, we do it for example when international celebrities visit our countries and we imagine them getting robbed or attacked by our stray dogs. It’s a type of speculative revenge that we manage to get. In this essay I will present a visual approach to this north-south tension through the revision of this image, a piece that contains so many paradoxes that exceed the mere anecdote. This image is telling us about digital colonialism but also about our sloppy and self-deprecating resistance. Using Peter Sloterdijk’s vision of design as a mask for incompetence, I will review the role of graphic design as an enabler of colonialist practices, but, through the revision of Raúl Ruiz’ “estilema” concept and Rosi Braidotti’s nomadic theory, I will also explore the possibilities of design to operate as a dissident force. I can’t help fantasizing about that interaction. A graphic designer who’s probably involved in every stage of the production process, negotiating creative aspects of his task with the maximum authority of a university. A small office at downtown Asunción. The catalog of “free photos" and its materiality. How did they make that catalog? Who are the other people in the catalog? Under which category is Mark Zuckerberg’s image classified? Chill computer programmer? Maybe they used Mark Zuckerberg’s image for other advertisements too? When the rector is asked if he knows who the person they put on the billboard is he just laughs and admits that now he knows that that young man is the creator of Facebook. Then he says the problem wasn’t a big thing either and finalizes giving vague answers about the corrective measures he’s supposedly taking in order to prevent this type of situation in the future. This was certainly an issue that gained more attention from us, meme-consumers of the social media rather than from the actual target audience from Unigran: people in peripheral areas of Paraguay willing to get affordable university degrees. The story of this billboard is a story of incompetence, and Peter Sloterdijk defines design as the competent liquidation of incompetence. To him, the purpose of design is “to secure the individual’s competence limits by providing the subject with processes and gestures for navigating as an expert in the ocean of his or her incompetence.” Sloterdijk vision’s is absolutely in line with what we understand today as good graphic design: elements that render invisible our incompetences, smooth, clear interfaces in which we do not struggle, a simple visuality that makes us feel smart and capable. Under this terms, the Unigran billboard with the Zuckerberg photo could be considered bad graphic design since it reveals a whole structure of incompetence. This is evident not just in the poor management of graphical tools (no detail on typographies, bad proportions of the “students” portraits, a frame that looks like a pre-installed template) but also in the big Latin American problem of how neoliberalism has promoted the emergence of precarious universities. And now in the light of recent Facebook’s scandals regarding their practices of selling users’ information to third parties as Cambridge Analytica, we can also witness in this billboard the paradoxical use of the image of Zuckerberg himself, this time as a victim of unwanted use of his personal data. Sloterdijk emphasizes his point on incompetence defining design as a “simulation of sovereignty: design is when one is capable despite everything.” And with this billboard our sovereignty was shaken, our competent internet browsing designed by white men as Mark Zuckerberg encountered this accident and we, Latin American people, had to reflect on our lack of sovereignty through the making of cynical jokes in our online public spaces. We know there will never be a Silicon Valley billionaire who studied in Paraguay and we’re not sure if that fact should make us feel sad or if that’s just material for laughs. Will Facebook’s competent design work in Latin America? This is not the first nor the last ugly billboard created to promote a private university in Latin America, but this billboard has the peculiarity of containing the image of the mega-rich person who wants to introduce his advertising business in our countries using an impeccably designed strategy that claims it will “connect the world”. 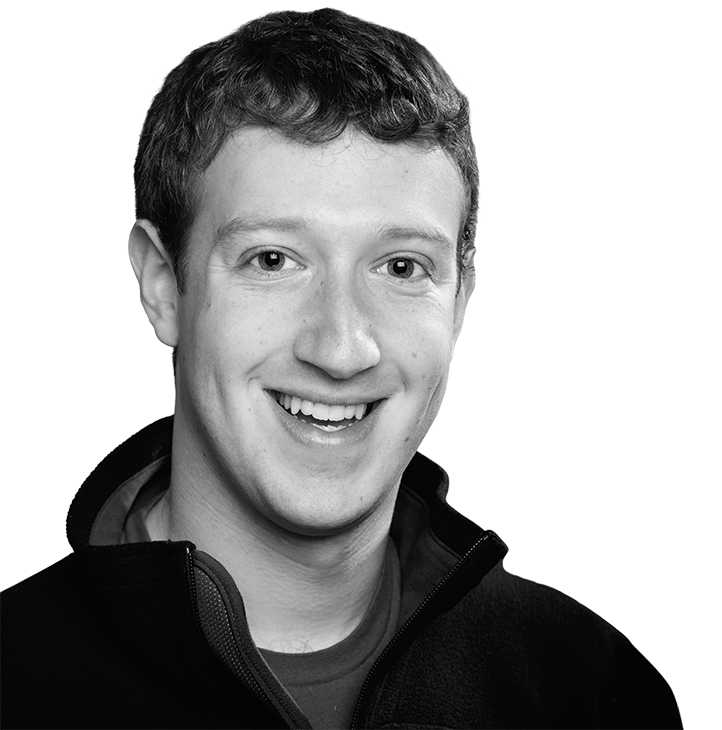 In internet.org Zuckerberg uses smooth competent design to promote his project of a second-class internet for the poor. This kind of aesthetic might resonate within the Latin American elites but it will not change the fact that behind this philanthropic project there is an endeavor to collect massive amounts of data that will be sold to third parties, this time taking advantage of the non-existent local legislation on data protection. Digital colonialism has an aesthetic arm too, since it intends to permeate our debates about digital developments with their visual imperative but the glass-alike looks that business as Facebook promote do not easily mix with developing world settings, places where innovative artistic expression is not in the marketing realm. This billboard is an example of this dissonance, it shows how advertising in Latin America has to be information-oriented and not minimalistic as the predominant visuality of tech business. Conversely, we will never see an ad of a successful company of the United States including a mobile phone number at the center of the piece. In the north, artistic notions are present in advertising, and while Latin American universities teach graphic design inside the margins of this aesthetic canon, our resources are not enough to afford that kind of piece in every publicity display. 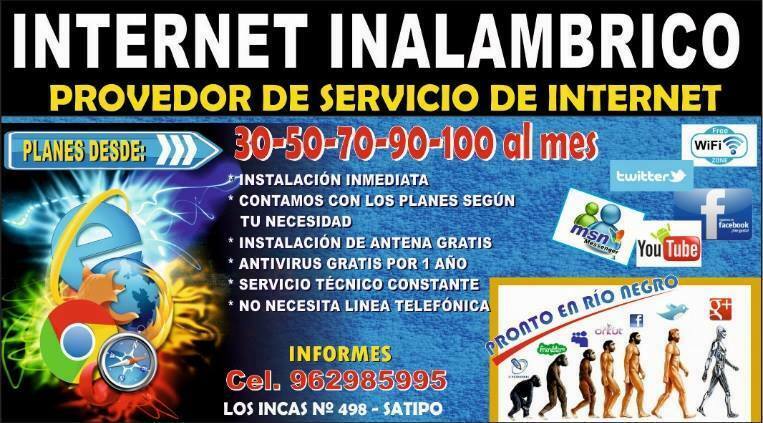 Ad for a Peruvian Internet service provider. Lots of informative and decorative elements. 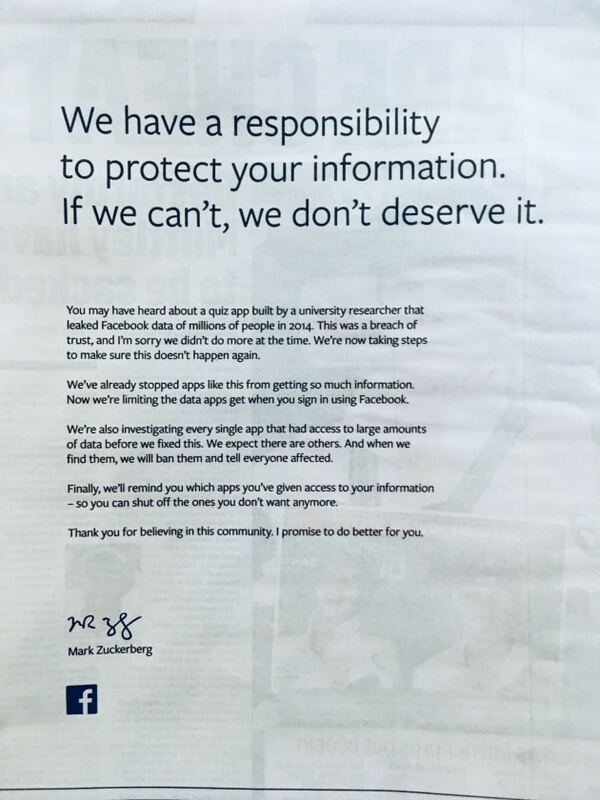 Minimalist ad with Facebook’s apology for the misuse of user’s data. Facebook has to deal with this dichotomy permanently. On one hand we have this clean, cool San Francisco aesthetic: an office with open spaces, programmers on expensive organic cotton hoodies, white walls, crystal panels and a pertinent piece of art painted by a well-paid graffiti artist. But on the other hand we have a massive production of ugly graphics in the platform itself: ugly memes, chains of posts accompanied with low quality images, a Tweety bird with a rainbow gradient background wishing us a good morning. Is this dichotomy sustainable? Do the visual forces in Facebook coexist in a balanced relation between approved and non-approved aesthetics or are these forces in the middle of a battle? Peter Sloterdijk locates design at the heart of Western modernity, and he establishes a continuum between “the genius and constructivism of modernity and the mediocrity and chaos management of post-modernity”. Having design at the core of this continuum means to Sloterdijk that design is a practice in support of the permanent revisionism of given social structures, never as a truly creative discipline. In our era, the figure of the colonialist modernist genius is alive and the line that connects imperialists as Columbus or Charles V with living idiots as Zuckerberg or Elon Musk is extremely clear. To Sloterdijk, design promotes this type of narrative through “the transposing of the creativity that was once associated with pathos into everyday manipulation of materials and symbols through the members of a worldwide design civilization”, this vision, plus Sloterdijk’s negative perception of designers as “make-up artists for bottomless confidence and creators of simulation methods for illusory hopes and false escapes” makes sense in the culture of digital colonialism. However, design is not an infallible method, and this billboard functions as the evidence of the impossibility of controlling the wild cultural elements that will unavoidably emerge from our communities. These wild elements that approved aesthetics cannot contain can be related to the concept of “estilema” proposed by the Chilean filmmaker Raúl Ruiz. He advocates for an artistic practice (in his case film), that becomes political through the use of non-verbal components that he defines as “estilema”. He proposes that in order to find these components, the film director should act as a photographer who works in a square, with this approach he or she will find deep signs that provide individuals with the conviction that they are living in a specific place and time. Therefore it contributes to a function of recognition of particular identities and settings. In order to permit these “estilemas” to flourish, Ruiz says that is fundamental to create an inquiring climate in the filming practice that in centered in plain observations, the result of that process will be that the images will gain symbolical weight, culminating in a final product that is not author-centered and the spectator will be the one creating the product with his or her own resources. In the case of the Unigran billboard, the story we can create is way beyond the limits of this rectangular sign. All the cultural elements I have reviewed in this essay emerge in the visual components of the image as moving layers of “estilema”: the graphic choices, the way the information is presented, and especially the fact that we knew about this sign from a photo that was taken by a Paraguayan citizen. My proposal is that through the capture of this billboard with the portrait of Mark Zuckerberg used without his consent, we are witnessing the impossibility of Facebook’s colonizing project, at least in aesthetic terms. Zuckerberg’s internet.org project violates net neutrality and it reeks of neoliberalism, but before those socio-political conditions, his endeavor and his presence is very very ugly and unpleasant when you look at it in this image: a smiling billionaire in a poorly designed ad installed next to some peladero. This ugliness is the starting point of our revenge, nothing annoys more a Silicon Valley CEO than disturbing design because it reveals their own incompetencies. And this is why it’s important to adopt an aesthetic perspective that operates as a resistance to the impeccable graphics of the first world. Dissident, decolonizing aesthetics must be nomadic in Rosi Braidotti’s terms. She proposes a nomad thought that encourages “the fleeting copresence of multiple time zones, in a time continuum that activates and deterritorialize stable identities”. Nomadic vision promotes the difference and the making of a converging space that develops simultaneously critique and creation. In order to embrace and apply effectively this intellectual invitation we have to be nomads between, for example, the living Latin American art and the structures of Western visuality. But we should also be alert of the commodification of differences that turn the “others” into objects of consumption, and to tackle an eventual capitalistic tactic that will try to co-opt the “estilema” it will be necessary to embrace the shock of ugly design. [^] Denis, J.A.Y., Rector de la Unigran: "Admito mi error por lo del cartel" (Unigran's rector: "I admit my mistake with the billboard". 2010, Paraguay.com. [^] Sloterdijk, P., The Right Tool for Power. Observations on Design as the Modernization of Competence., in The Aesthetic Imperative. 2017, Polity Press: Cambridge. [^] Ipandetec, et al., Civil society declaration concerning Internet.org/Free Basics in Latin America. 2015, Derechos Digitales. Link. [^] Ruiz, R., A Dialogue with Raúl Ruiz by Enrique Lihn, E. Lihn, Editor. 2009, Revista Atenea: Concepción. [^] Braidotti, R., Nomadic Theory. The Portable Rosi Braidotti. 2011, New York: Columbia University Press.